Profit. Growth. Risk. Offering. We’ve Got All the Bases Covered. While the primary strategic objective of enhancing franchise value might be common, the path for each financial institution is quite different. Digital transformation is inexorably changing the banking model. Your strategic planning process has to keep pace. 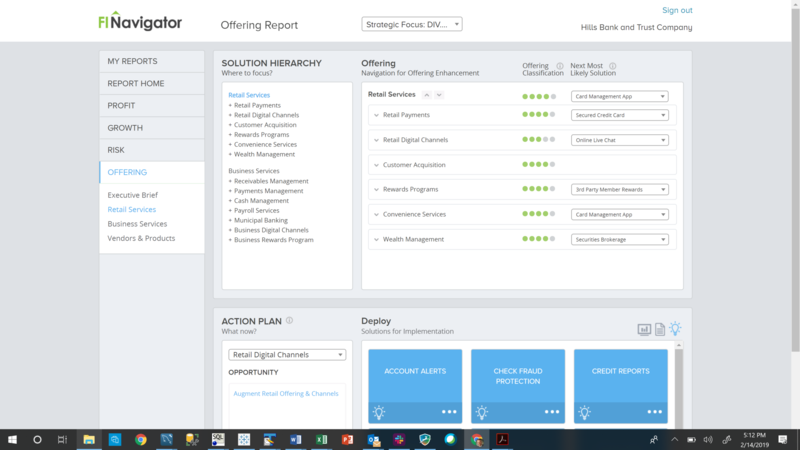 With FIN Advisor you can deploy the industry’s most advanced data & analytics to quickly develop a strategic plan that is truly transformative. Leveraging any peer group, FIN Advisor delivers opportunity themes, strengths/opportunities and recommended areas of enhancement for your institution’s profitability, franchise growth, risk management and even customer offering. Quickly generate a Profitability Enhancement plan for your institution leveraging your choice of provided peer groups or your selected peer group. To instantly generate your plan, FIN Advisor will process hundreds of unique profitability metrics, quantify cost/benefit, establish primary themes and recommend potential actions. Instantly pinpoint your profit enhancement opportunities now. Instantly develop a Franchise Growth plan for your institution leveraging your choice of provided peer groups or your selected peer group. 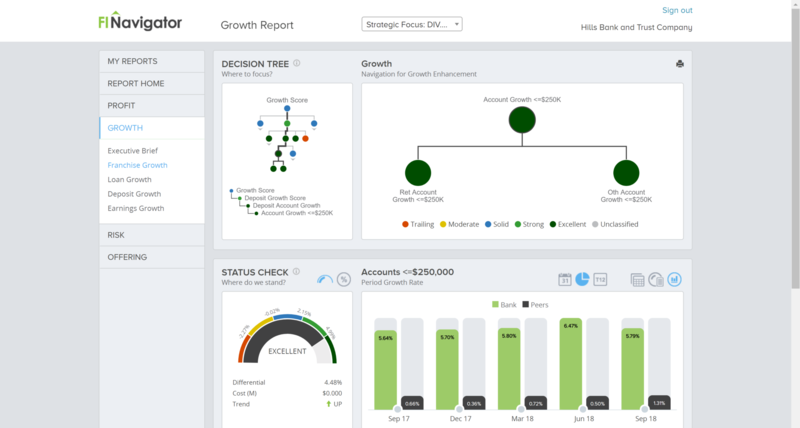 To instantly generate your plan, FIN Advisor will process hundreds of unique growth metrics, quantify cost/benefit, establish primary themes and recommend potential actions. Instantly examine your franchise growth opportunities now. Quickly generate a Risk Assessment for your institution covering Capital Adequacy, Asset Quality, Liquidity and Earnings Quality (“CALE”). Leverage your choice of provided peer groups or create your own unique peer group. 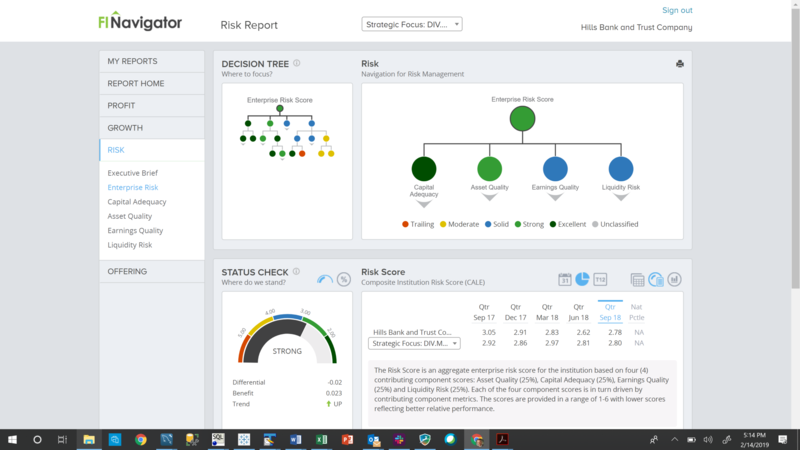 To instantly generate your risk assessment, FIN Advisor will process hundreds of unique risk metrics, quantify risk scores, establish primary themes and recommend potential actions. Instantly view your risk assessment now. Determine your next-most-likely retail, business or operating solutions based on peer solution sets. Quickly generate a Product Strategy plan for your institution leveraging your choice of provided peer groups or your selected peer group. To instantly generate your plan, FIN Advisor will process an in-depth hierarchy of retail, business or operating solutions against your peer institutions to produce primary themes and suggest next-most-likely solutions for areas ranging from retail payments to business digital channels. Identify your next-most-likely solutions now. 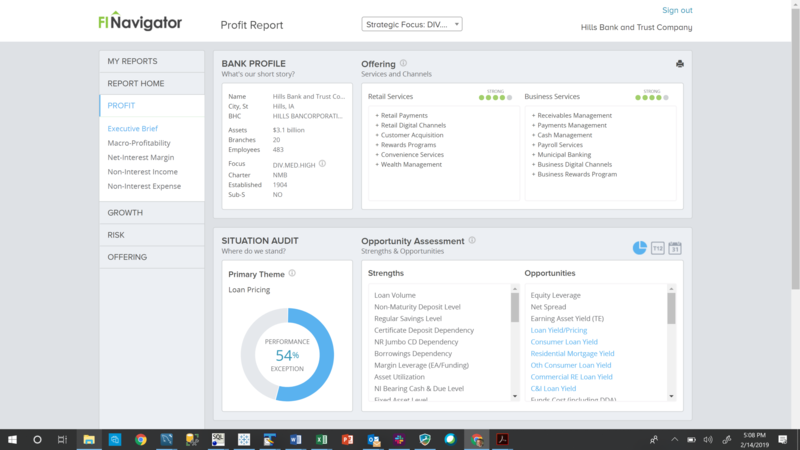 Whether you manage a community bank, credit union or regional institution, FI Navigator’s unprecedented data & analytics provide you with the decisioning support to augment your institution’s profitability, franchise growth, risk management or product offering.